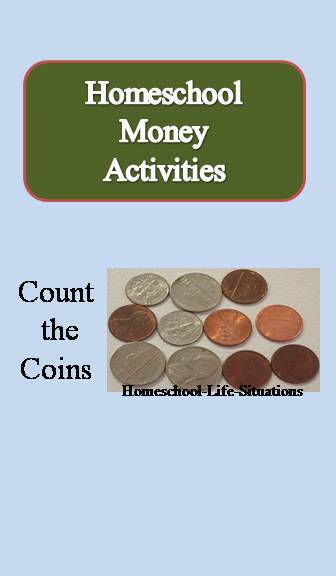 Here is some fun teaching about money activities. I used real coins with my children when they were in elementary school. When you homeschool you have the advantage to count change every day. You can also use play activities and do story problems. To keep your child’s interest you can also talk about the history of money. One activity that my children enjoyed when they were young was playing store. I would gather canned goods, candy, small toys and other items for my children to buy. I would place price tags on each item. I would only use amounts that my children add and subtract. I would give each child some coins. They would then go shopping. When you are teaching about money at home use real coins. I preferred using real coins because plastic money did not look or feel real to me. I kept a dollar's worth of each coin. I had a zip lock bag of one hundred pennies, twenty nickels, ten dimes, and four quarters. Every day I would give my children a cup of coins. I started with pennies. Next we would count dimes because counting by ten is a little easier than counting by fives. After my children could count pennies and dimes we would count nickels. Last we count quarters. After my children can count each coin the next step is to combine them. I would give them a card with an amount written on it such as 26 cents. They would find coin combinations to make 26 cents. My children would also make a chart showing the ways you can make 26 cents. The last step involved counting out change over a dollar. 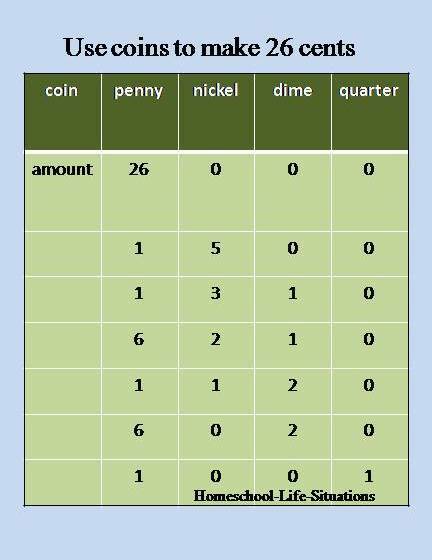 Here is an example of a problem; count out $1.59 using the least number of coins. A pencil costs $0.50, a notebook costs $2.00, and an eraser costs $0.25. How much did I spend at the store? I have $5.00. Candy costs $0.50, pop costs $1.55, a sandwich costs $2.00, a bag of chips costs $0.55, and a piece of pie costs $1.25. What can I have for lunch? A sweater costs $35.59. I have $43.50. Do I have enough money to buy the sweater? Do I have any money left over? Sometimes I like to worksheets to teach about money. I found a site where you can generate your own problems. At Teachers Corner you can make money worksheets for the United States, Canada, Europe, Australia, and English money. You can print problems using coins or bills or both. Print the sheets in either color or black and white. You can also print the answer sheet. Did you know that you can combine your math with history? When your children are learning about how to count change teach them about other items that were used for exchange. By definition money is exchanging something for something of value. Two people might decide to barter for resources or services. The items exchanges will benefit both parties. Cattle or other livestock and cowrie shells have also been used as money. China made the first coins and paper money. They also used leather. The Native Americans used wampum beads made of clam shells. Also study about the United State mint. Find out what we base our money on. The designs on coins and paper money have changed over the years. My children like collect old coins. I continue to teach about money in high school. Older children need to know about taxes, interests, and buying on credit. I want my children to understand about making money, buying and saving. Teaching about money is an important skill. You can combine math, history, and culture into your study. I promise to use it only to send you What's New at Homeschool Life Situations.